Another year has gone bye and another Prime Day is almost upon us! The official Festivities for Prime Day 2018 begin at 3PM eastern on Monday 7/16/18 at Amazon. Amazon has published a handy Prime Day guide, and as usual, this morphs into a Prime Week of festivities (as opposed to just a single day), with some offers already going live, including a variety of credit cashback promotions for those paying with a Prime credit card (Chase Visa or Amazon store card). These include 20% back on the GoPRO HERO (2018) action camera. Other early offers include the Echo Show creature for $139 (up to six per customer at the sale price), and some new product launches that Prime members get first dibs on. Keep an eye also on the good old Gold Box if you prefer that display format of deals. Only Prime members can participate in these festivities, however, if you are not a Prime member and want to participate, you can start a FREE Prime Trial and enjoy these festivities along with the other Prime Benefits for 30 days. Amazon keeps adding more and more to the Prime Benefits, but that’s not all. They strategically decided to go BIG with their TV streaming business, making expensive purchases and plans, such as an upcoming Lord of the Rings TV series. So the writing was on the wall that the Prime membership fee would go up. And it is. Annual Prime membership fees will increase from $99 to $119. Discussion of the news organized nicely by Techmeme. The $119/year membership fee goes in effect on May 11 for new members, and June 16 for renewals of existing subscriptions. You can cancel your existing subscription before it renews if you don’t want to pay this higher subscription fee. If you want to get in at the $99 for the first year, as a new or previous Prime member, you can sign up for Prime Membership now for $99. 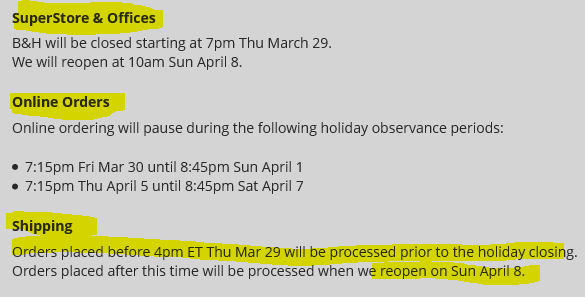 As far as I can tell, existing Prime members cannot manually renew their subscription ahead of time using the Prime account website. I don’t know if it’s possible to renew it ahead of time by talking/live-chatting to a customer service representative. LOL Amazon Gold Box goes in QVC mode! Speaking of the Gold Box, running until Wednesday at 3am eastern they have a sale on Anker products such as chargers, power banks and cables; and a $6 iPhone X case. The main listings index of the Olympus USA Outlet store has finally seen some improvements. You can now see from the index of available items which ones are out of stock and you can add-to-cart directly. A step in the right direction, but more work must needs be done! Overshadowed by the LOL-worthy and Black Mirror-esque news of Alexa laughing at customers (it’s not you, it’s Alexa, or the ghost inside the Echo 😉 was another new expansion of the Prime pool by Amazon. They are launching a Prime discounted membership option for qualifying Medicaid recipients for $6 per month. This is similar (or an expansion) of their existing $6/mo EBT membership. 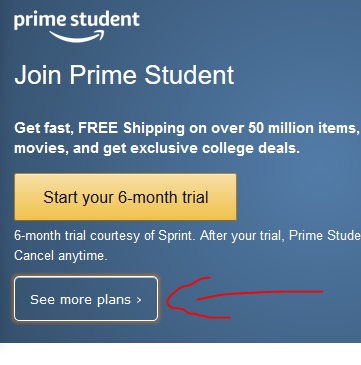 Just like “Amazon Student”, a customer can be on this discounted program for up to four years. The list of Prime benefits is getting longer and longer, and Amazon is also making noise about getting into the health care business. Certainly this Medicaid development is a step in the right direction. What next? Prime NOW will deliver a doctor to your front door when you want/need one? With Ritz/Wolf mostly disappearing and local camera shops fading away as well, drugstore chains are often the places many people go to for prints. And we have a new development on the drugstores front. Walgreens had previously agreed to purchase some Rite Aid stores, but they are not buying the whole company. Announced today, the Albertsons group of companies will be buying Rite Aid, over 2500 remaining stores that are not purchased by Walgreens (buying over 1900 stores) according to the aforelinked Forbes article. Some thought the day would never come, but as of February 18 in 2018, this is for real! Amazon Prime members can now receive free standard shipping for most of their Woot purchases. This was announced on the official Woot blog and there are also notices scattered throughout the Woot website. The benefit is free standard shipping, not free 2-day shipping, but it’s definitely better than paying $5 per calendar day for purchases. T-shirt purchases however get “free express shipping” which makes sense, since they are lightweight and they can be compressed for shipping purposes to the size of a burrito if need be. There are some exceptions though. “Gourmet” items, sold by the Gourmet sub-Woot (formerly Wine) are not eligible. You’ll get confirmation on the product page and the shopping cart on what qualifies. 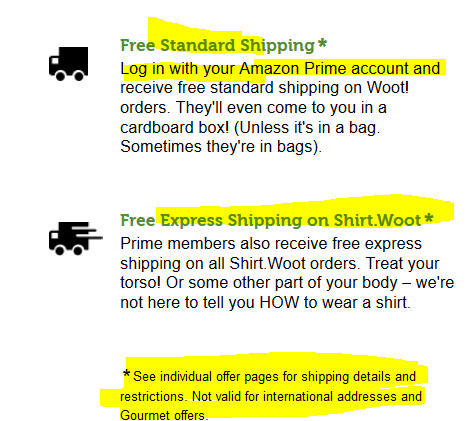 If you are a regular Woot shopper who’s not a Prime member, it’s not a bad idea to give it a try, they offer 30-Day Free Prime Trials. If you make Woot purchases on 20 different days during a rolling 12-month period, that’s the price of a 1-year Prime subscription (20 x $5 = $100). The list of Prime benefits is getting longer and longer. Take a comprehensive look at our Amazon Prime Benefits mega-post at the main blog. Woot has updated their return policy, now allowing returns of products you just didn’t like. Returns are no longer restricted to damaged or defective items. There are some reasonable restrictions (specialty carrier for oversize/bulky, perishables, altered clothing, hazardous materials, etc) to the new policy which you can find at their FAQ page. If you make online purchases from out of state retailers that don’t collect sales tax, this may change depending on what happens after the Supreme Court hears a counter-case. The vast majority of States (when you consider that some don’t collect sales tax) are behind this push that will allow them to force online retailers (without a physical presence in the state) to collect sales tax anyway. In other words, if the Supreme Court agrees with the states, your purchases from NewEgg or B&H Photo or Monoprice or Adorama will have sales tax included regardless of which state you live in (if that states collects sales tax). This will also affect some purchases at Amazon. The article above from the Associated Press (hosted at ABC) incorrectly states that Amazon is not affected. Right now, purchases from Amazon itself have sales tax charged, however, purchases from 3rd-party sellers are left to the 3rd-party sellers, and as far as I can tell, the majority of 3rd-party sellers that do not have to collect sales tax, do not collect sales tax. So if the Supreme Court agrees with the states, Amazon purchases from 3rd-party sellers will also be collecting sales tax. Circuit City is planning yet another comeback (attempt). The new plan calls for a new experiential (not experimental) website launching the day after Valentine’s Day (February 15), to be followed with kiosks, stores within stores and even their very own stores if all goes to plan. Imaging will be one of their areas of interest. Details from TWICE at CES 2018. Anyway, a new attempt at modernization has been launched, an alternative to the existing user interface, the Woot Discover, a visual listing of some of their latest offers, in a tablet-y kind of design. Over 500 items are listed there. This is a heads up! This Friday, December 29 (2017), Amazon will be having its annual Amazon Digital Day where a variety of digital products will be offered for sale. This includes software and apps, including software subscriptions. So potentially there might be offers on software packages and software subscriptions. They’ll also have offers on eBooks (eg photography books and camera guides), movies/TV, music, Amazon Coins, and more. The pre-sale action begins on Tuesday December 26 and will continue daily until the Friday Digital Day. Amazon’s schedule varies depending on camera/product but also the physical location of the product in question, and the physical location of the buyer (or the delivery address if sending to others as gifts). The official DJI store has launched a new annual DJI Select membership for $29 per year. This gets you the option to buy “DJI Care” for 50% off, you get early access to new products, exclusive coupons and discounts, and a birthday coupon. NOTE that to purchase DJI Select, customers must have purchased drone with DJI Care after November 1, 2017. Check their website for more details. 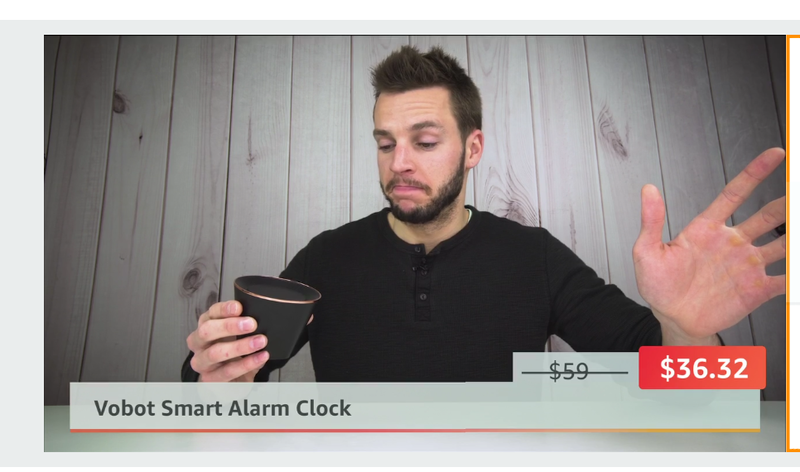 Do you often find things you like at Groupon, but end up not getting them because your order total is under $35 and adding the $3.99 shipping fee ruins the deal? Just in time for the upcoming Holiday Shopping Season, Groupon is offering a 90-Day Free Shipping Subscription for a $15 one-time fee. It’s like a Mini Prime. This gets you free shipping on every eligible order for the next 90 days. Typically Groupon offers free shipping on orders of $35+. So if you think you are going to place four or more orders in the next 90 days that would otherwise charge you $4 shipping, then you come ahead. The 90 day clock starts with purchase date. For example, if you purchase it today, it would run until January 12, 2018 [both October and December have 31 days]. RESTRICTIONS: just like Prime, this offer only applies to items sold and shipped by Groupon Goods. Items sold by Marketplace sellers (3rd-party sellers, not Groupon itself) are NOT eligible for the offer. Not eligible are items that require special delivery or white glove and such. In other words, items that would otherwise get the standard $3.99 flat shipping will be get free shipping while you are subscribed to this mini-Prime. This will likely increase impulse buys, so if you are trying to avoid those, this is probably an enabler! Adorama’s physical store and warehouses will be closing for the Sukkoth Holiday. If you need an order shipped before the h9liday closure, make sure you place your orders before Wednesday 12:30pm ET at the Adorama website. Orders placed after the cut-off point will begin shipping on Monday 10/16/17. You can still submit orders in the meantime, but they won’t ship until they re-open. eBay did not wait until Friday night to sneak in announce new updates to their Terms of Service. According to an email sent to its members, the key change to the user agreement is that Sellers who try to complete eBay listing sales outside of eBay (to avoid paying the various eBay fees) may be charged Final Value Fees regardless. Not sure how eBay is going to find out, but that’s what the updated Terms and Conditions say. The ever-changing retail landscape makes for strange bedfellows. Kohls and Amazon will begin a new experiment starting October 2017, 80+ Kohls stores in the Chicago and Los Angeles areas will be …accepting Amazon returns according to Reuters. What and how will probably revealed in those markets when the experiment begins. If you have an American Express, you may already be getting (or eligible to get) a FREE 1-Year subscription to Shoprunner. But now PayPal is coming in with an offer of their own, PayPal members can get a FREE 2-Year Subscription. Shoprunner is a Prime-like service in terms of free shipping that includes a variety of online retailers (not Amazon), NewEgg, Staples, and many fashion brands. In a related move, Google has a new partnership with Walmart to enable Voice Shopping using the Google Assistant using the Google Home device. 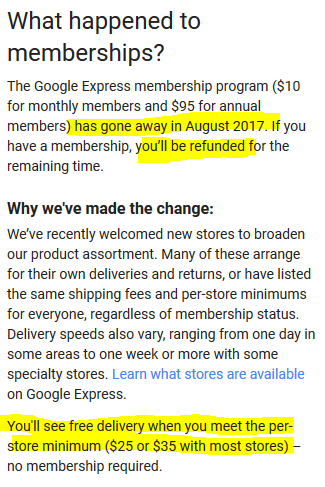 Furthermore, Walmart will be joining the growing list of merchants participating in Google Express. 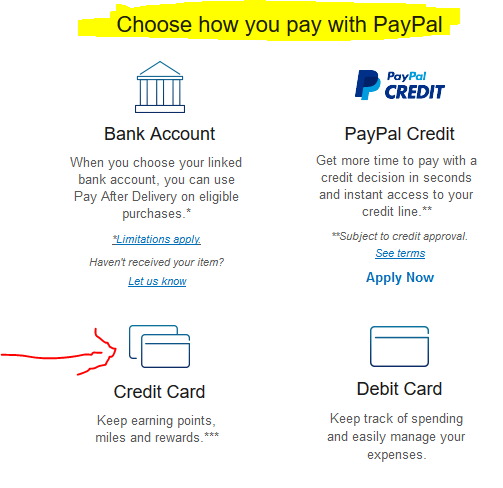 After wasting the time of millions of online shoppers who had to frantically change the PayPal payment method to a credit card every single time they made a purchase so iffy eBay sellers wouldn’t raid their checking account directly, PayPal, now in trouble because there are LOTS and LOTS of other alternative payment methods, FINALLY allows you to set a default payment method to …the one you like, including a …credit card (*GASP*). Starting October 2nd in 2017, Amazon will activate a new policy that makes it easier for buyers to return products purchased and shipped directly from 3rd-party sellers. You will no longer have to contact the 3rd-party seller for a return. You will be able to do it using the Amazon website which will print a prepaid (by the seller) return-shipping label. So the return process will be similar to that of products shipped or fulfilled by Amazon itself. There’s also a new option for (non-)returning low-cost or high-shipping items or defective items. The sellers have the option to opt-in for “returnless refunds”, where the cost or condition of the item may be such that it would cost the seller more money to process a return, so they’ll instead let the customer keep the item while still issuing them a refund. From a Buyer perspective, this is great news as it will weed out some of the more iffy or careless sellers, and give you more flexibility in being able to easily return products that are unsatisfactory or defective or otherwise not-as-described. But from a seller perspective, this is a “sky is falling” moment, where worries of all kinds are expressed by Amazon sellers in multiple threads in the Sellers forum. Fraudulent returns, “free rentals”, losing big on return fees and shipping, feeling pressed into using “fulfilled by Amazon” and so forth. The two biggest TV home shopping networks of the over-the-air antenna era are now one! QVC and HSN are becoming one in a $2.1 billion M&A deal. But wait, if you call now, you’ll get a BONUS TV shopping channel for ABSOLUTELY FREE! Details through Engadget. This is a PSA! The eBay Bucks rewards you may have earned for the month of June are now ready to spend! Check your eBay emails or eBay messages or the relevant part of the eBay website that shows the eBay Bucks. Thanks to the new terms of the program, you don’t have to earn at least $5 per month to spend your rewards. Now any amount is good. The downside of the changes is that they lowered the default earning percentage from 2% to 1%, but they have recurring “Bonus Bucks” promotions. The new reward certificate expires 8/2/17. If you are looking for ideas on how to spend it, check the eBay Deals along with the Top 100 Trending Deals. If you are an Amazon shopper, and you wonder how all those different 3rd-party sellers get ranked in the Amazon “Add to Cart” section of each product page, you may find this new article at Buzzfeed interesting, as it explains some of the factors and issues, with quotes from multiple Amazon sellers. A data analyst in the article best defines it: “In a lot of ways the Buy box is a slowed down stock exchange”. Retailer News: Amazon buying Whole Foods for $13.7B in Cash! Would you like an organic DSLR with your organic apples? You may soon be able to buy them both side by side. Okay, probably not, but in a surprise announcement today, Amazon revealed that it is paying $13.7 billion in cold hard cash to buy Whole Foods. You can find coverage of this at major tech and business websites and opines by social media gurus, all nicely organized at Techmeme.com. If you like to shop at Amazon, but don’t want to sign up for a Prime membership [list of benefits], and don’t want to place $35+ orders, we have some good news for you. 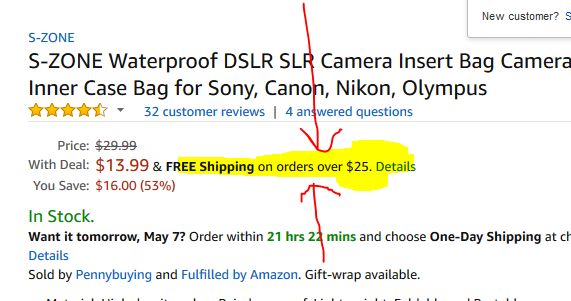 It looks like Amazon has lowered the free shipping threshold from $35 to $25. While price-checking some of the Bag The Bags, this came up, the minimum shown is $25 instead of $35. This showed up when not logged on to an Amazon account, and also if logged on to a non-Prime account. I don’t know if this is a limited time or limited scope experiment (Amazon LOVES to experiment) or this is permanent. (permanent until they change it again that is). In the previous iterations, books got free shipping with $25+ orders, presumably price-matching the long-standing Barnes & Noble offer. If this sticks, it means books and non-books get free shipping on $25+ orders. If any of our readers reside in the actual Manchester-by-the-Sea city (around 5K residents there), Amazon will be sending you a gift box at your addresses with a 1-Year PRIME membership, along with three bags of popcorn. The press release has a picture of the box. Both will be as gift cards, no popcorn in the box, you have to order it separately. This is to celebrate awards won by the movie “Manchester by the Sea” which will begin streaming for FREE for Prime members on May 5.